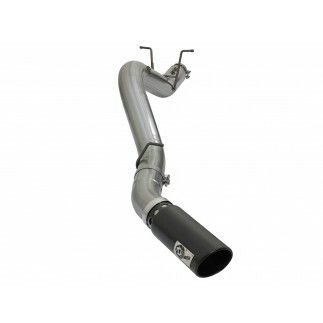 This 409 stainless steel High-Flow muffler is designed to provide a deep throaty, powerful sound on acceleration, but maintain a smooth sound at idle. 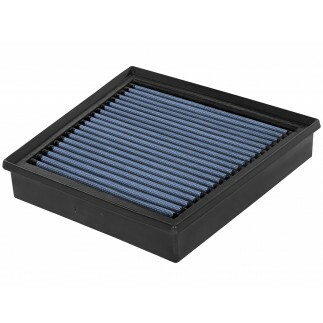 This muffler is constructed uses a straight through perforated core with heat resistant packing to reduce backpressure and maximize flow. 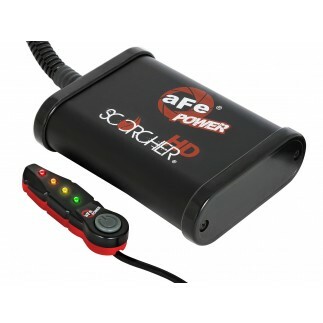 Also featuring a stamped aFe POWER logo for an added style. Muffler Specifications: 4" Center Inlet /Outlet, 8" Round x 24" L Body Diameter. Features OE-style bayonet hangers to maintain stability during high-rev vibration and high-temp conditions. Provides hassle-free installation. 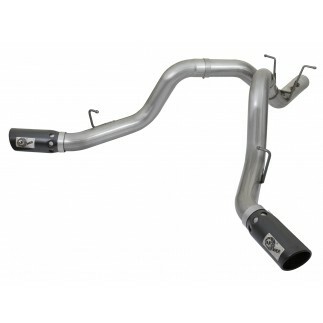 This Rebel XD exhaust system is constructed of 4" mandrel-bent 409 stainless steel tubing for maximum flow. Smooth transition bends allow for low turbulence, increasing horsepower, torque and throttle response. Finishing off this exhaust are dual 5" black stainless steel straight-cut intercooled exhaust tips featuring a laser-cut stainless steel "aFe POWER" badge for added style. Cutting is required for some cab configurations.